One year ago, on Black Friday on Britain’s busiest street, the “sound of gunfire and explosions” created a panic among Christmas shoppers convinced the city was under a terror attack. Dozens of people were hurt in the ensuing stampede and in a fight that broke out in the Oxford Circus station in the London Underground. It was, ultimately, a false alarm—and exactly the kind of disorderly response that counter-terror police in Britain want to avoid in the future. As a result, they’re requesting retailers in high-risk locations to review what staff knows about how to respond in such a situation with a goal of improving reaction times and ensuring smoother evacuations. The push to improve safety in evacuations of shopping areas coincides with the release of the UK’s ACT Awareness e-Learning course, which is designed to help all staff that work in crowded places to be better able to protect themselves, coworkers, and the public. Who is appointed to make decisions on the shop floor? Where are the best places you can hide in an attack? How do you know what type of scenario you are in-that is, whether to evacuate or shelter in place? In an evacuation or an emergency shelter-in-place situation, every second counts, suggested Aldworth. So retailers need to provide staff with the knowledge they need to successfully manage store and shopping mall chaos. Retail workers in the United States have been killed by rushing crowds. Worldwide, there are roughly 2,000 fatalities resulting from uncontrolled crowds yearly, according to University of Melbourne Professor Roger Hughes, a leading researcher in the prevention of crowd trampling deaths and injuries. Injuries are more common, and the Internet is full of amateur video of crowds at US retail stores pushing and pulling over sales merchandise. Concerned about the risk of crowd-related injuries during special sales and promotional events, OSHA issued advice in 2012, Crowd Management Safety Guidelines for Retailers. In addition to the real risk that crowds pose to safety, retailers often face the cost of defending itself against fabricated injury claims by unscrupulous individuals who know that anytime a crowd is pushing there is a lawsuit waiting to be filed. In one case, for example, a woman claimed she was knocked unconscious by door-rushing shoppers on Black Friday at a major retailer. It later came to light, however, that the woman had filed 15 similar injury claims against retailers in the past. 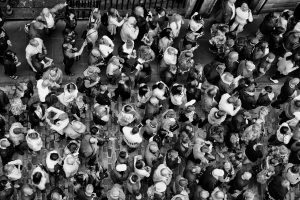 Crowd control is a critical crisis management consideration for any retailer that may need to contend with crushing crowds in a terror incident, special event, or popular promotional sale. Contrary to appearances, crowd behavior can be reasonably predicted, according to Hughes’ research into human traffic and the modeling of actual trampling incidents. By anticipating and analyzing the crowd density, speed, and how individuals assess the situation and choose paths to reach their goal, organizers should be able to predict ‘danger spots’ and implement appropriate traffic control measures, he said. Specifically, his research shows that when crowds reach a density of five people per square meter, people are in danger of being trampled. The risk from crushing occurs at a density of approximately 10 people. Location and layout of the store/venue and the design of circulation routes. Strive to strike a balance between limiting entrances to control crowd flow into a cramped area and allowing a large crowd build-up outside. Use barriers to help direct crowd flows and, to the extent possible, strategically place desirable areas or amenities in an effort to spread out a crowd within a facility. Train management and LP staff in crowd control techniques and ensure contracted security staff have undergone crowd management training. Extent to which visitors are likely to be familiar with the location’s layout and design. Unfamiliar visitors can block routes and create blocking hazards, so it’s critical to have ample signage to help people make their choices quickly. Also, in an emergency, people will escape via the exit they know best, even if it’s not the safest escape route, something emergency planners should factor in. Type of crowd expected. The ages, social, and racial make-up of a crowd will affect crowd behavior and suggest appropriate arrangements. Plans, such as security force level, should be assessed against the expected size and type of crowd. Safety also needs to be examined form the perspective of the crowd’s goal; for example, if it’s to gain sight of something or someone-such as during an in-store music performance-then anything climbable becomes a potential fall hazard. Physical location features that can contribute to injury. These include dead ends and locked doors or gates; convergence of several routes into one; and uneven or slippery flooring or steps. Potential for hazardous conditions to develop. These include: (1) Reverse or cross flows in a dense crowd; crowd flows obstructed by lines or gathering crowds; and large pedestrian flows mixing with vehicle traffic or other hazards. Set targets for crowd management that, if exceeded, will trigger a response. consider allowing entry in stages.